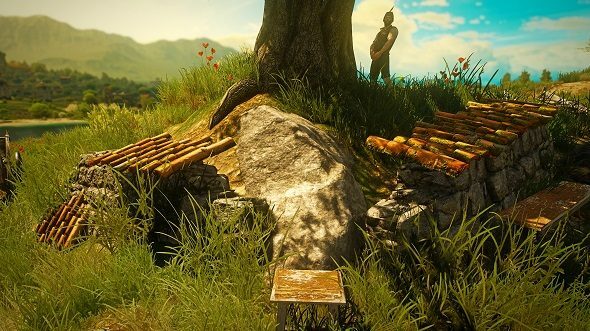 Given how gorgeous The Witcher 3: Wild Hunt is out of the box, it’s amazing to see how much effort modders have devoted to making it look even better. Modder Halk Hogan PL has been working on his HD textures mod since 2015, and the latest version gives the Witcher 3’s environmental textures and models a remarkable amount of extra pop and depth, while staying faithful to the original design. Hogan has gone back through and added additional fidelity to just about all 3D rocks and stones in the game, and done an “Ultra HD” pass on power stones, palisades, bricks, thatched roofs and stone walls, metal cages, torches, cobblestones, and more. If you like The Witcher 3, you’ll love our list of the best RPGs on PC. In Toussaint, the area featured in the Blood & Wine DLC, he’s also improved the look of water in sewers, puddles, and brooks. It’s an impressive achievement: the Witcher 3 HD Reworked Project really does make a big difference in the Witcher 3’s environments. Stones genuinely look, well, stonier. You can see other improvements in the before-and-after comparison video (below), such as increased detail on pine boughs, and metal textures looking less like battered chrome and more like real iron tools. Hogan says the mod shouldn’t require taking much of a performance hit, although when we checked in on version 5.0 he anticipated up to a 5 fps drop on mid-range cards, with a minimum of 2GB of VRAM. If you’ve got something on the higher end, Hogan’s mod should look spectacular in 4K.